Identification: Upperside is orange and black, resembling the Monarch (Danaus plexippus), except the Viceroy has a black line across the hindwing and a single row of white dots in the black marginal band. Where Monarchs are rare in Florida, Georgia, and the Southwest, Viceroys are brown instead of orange and mimic the Queen (Danaus gilippus). Life history: During most of the day, males perch on vegetation or patrol around the host plants to find females. Females lay eggs at the tip of host plant leaves, depositing only two or three eggs on a plant before moving to another. Caterpillars eat their eggshells after they hatch, then at night feed on catkins and leaves. Young caterpillars make a ball of leaf bits, dung, and silk which hangs off the leaf on which they are feeding; the dangling mass may distract predators. Third-stage caterpillars make a shelter from a rolled leaf tip in which to spend the winter. Flight: Two to three broods from May-September in most of its range, all year in Florida. Caterpillar hosts: Trees in the willow family (Salicaceae) including willows (Salix), and poplars and cottonwoods (Populus). Adult food: Early in the season when few flowers are available Viceroys feed on aphid honeydew, carrion, dung, and decaying fungi. Later generations feed more often at flowers, favoring composites including aster, goldenrod, joe-pye weed, shepherd's needle, and Canada thistle. Habitat: Moist open or shrubby areas such as lake and swamp edges, willow thickets, valley bottoms, wet meadows, and roadsides. Range: Northwest Territories south along the eastern edges of the Cascade and Sierra Nevada mountains to central Mexico, east through all the eastern United States. 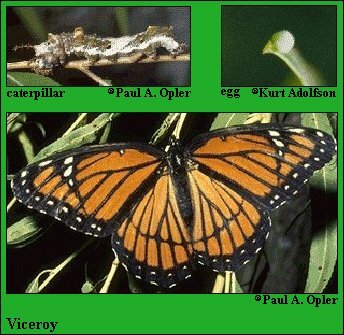 Conservation: The Obsolete Viceroy (subspecies obsoleta) has lost much of its habitat due to development, water impoundment, and the exotic aggressive saltcedar. Management needs: Restore riparian habitats in the Southwest. Conserve extant habitats.